1. 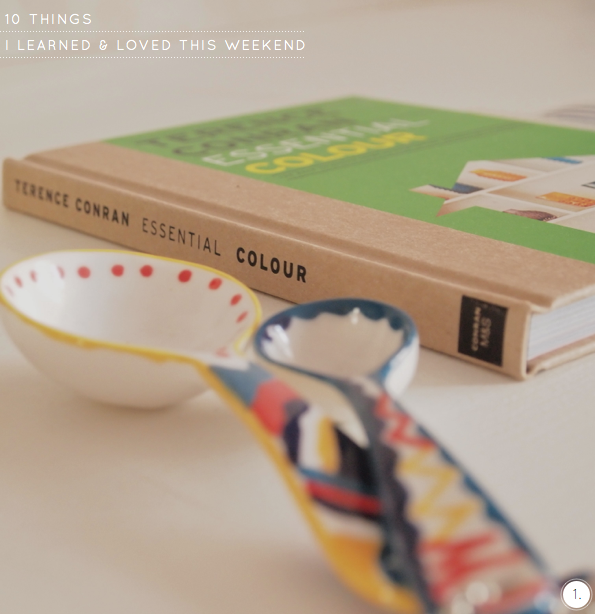 Enjoyed reading Terrance Conran's Essential Colour book. 2. I happened upon these beautiful tiles whilst out walking in London - I felt so inspired by the colour. 3. Industrial style shelving with colour blocking? Home decor win! 4. These confetti bags from We Are Citrus are a sure fire way to brighten a present or card. 5. I never tire of these colourful latte bowls in Anthropologie. 6. 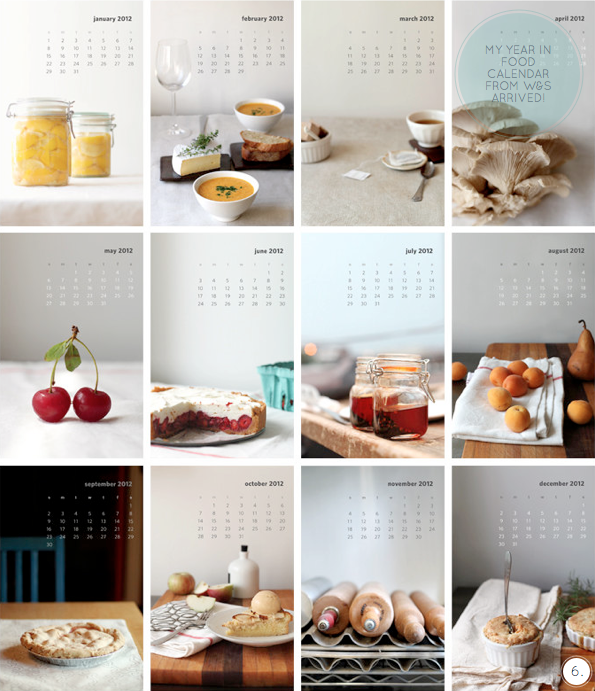 My 'A Year in Food' calendar from Whimsy & Spice arrived. 7. These Paris themed notecards made me excited to visit the French capital. 8. Love the rustic and organic feel to this bottle opener. 9. The colouring of this Naxos dinnerware conjures up images of the azure Mediterranean sea. 10. I couldn't resist adding another striped number to my wardrobe. I want that calendar - the pictures are beautiful, and so colorful! Love the calendar Will, it so beautifully shot! ooh i almost forgot you were headed to france! what dates will you be there? those notecards are so cool. very masculine! Love the calendar, right on the spot with its pictures! I need not mention that I love everything here. My favorite is the Naxos dinnerware - reminds me of those little plates I bought down here in Munich. Happy week! Happy new year Will! Hope you had a fabulous break :) those shelves are great and I think I have a striped top collection almost as extensive as yours! Love you post as always, Will. your calender is a really adorable - love the photos. Have a wonderful week, Will. There is so much to love in this post. My favourite would be the latte bowls, notecards and the tiles. I'll be thinking about these tiles for the rest of the day ... swoon! What gorgeous dinnerware! And I love those friend notecards. What a tasty calendar, wish I could be snacking on may and june right now! I`m crazy about colourful cafe latte bowls too. I could have stacks and stacks of them. Finally, after a week of craziness & sick kid.. It's time to really savour the New Year.. I wanted to wish you a very Happy (and healthy!) New Year Will! Looking forward to seeing and experiencing all things Bright & New with the Bazaar! I always love your 10 Things & Bright Links, it introduces me to so many incredible people, things and places. Have a lovely week! I'm so happy to see my little confetti bags here. 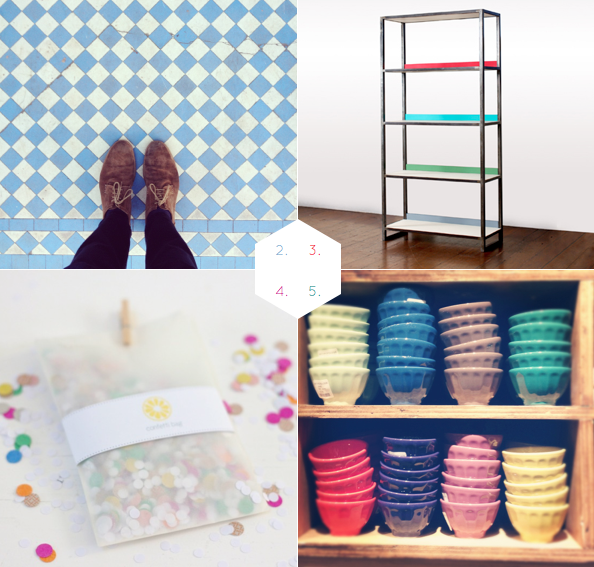 Your blog always makes my day brighter, so many cool finds. You inspire me to blog more. Happy new week Mr. Adding-Some Brightness-To-Cyberland. A little bit of color + industrial is a new and fresh approach. And Naxos dinnerware is stunning. Will follow the link. That's a fabulous calendar! That would be so fun to hang in the kitchen. 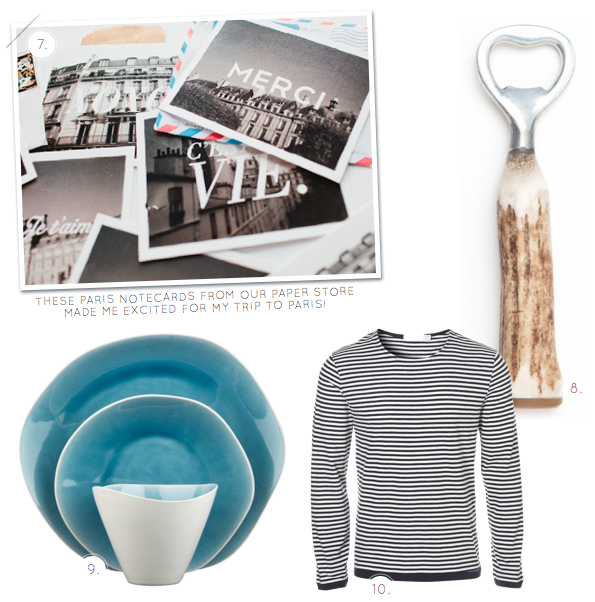 I love those Anthro bowls-every time I go in there I want to get all of their kitchen stuff! It's always so colorful and yet has a homey, rustic feel. Anyway, looks like you had a very stylish weekend! Loving the spread as usual. Darling, one can never have too many stripes in the wardrobe.. Take if from a Swede - we loooove our stripes!! Hi from Spain!I´ve just meet your blog thanks to STYLIZIMO BLOG and I like it too much. I think these tiles are beautiful too. Pictures are niece. Those Naxos pieces are gorge. Thanks for sharing! Food in calendars, just the way it should be! I mean, how else could we get motivated for the year, right? Cool finds! i just discovered your blog through the comments on joyofallcrafts.com and i must say it's the most visually appealing blog i have ever, EVER seen. love the way you style your posts - they look better than a magazine!! Love the shot of those tiles! The perfect robin's egg blue! Oh I love the colorful photos! And the french postcards especially. Your weekends make me jealous :). How insanely gorgeous is that blue tiled floor? And the calendar? I died. I want to live in this post - every picture here is gorgeous.